Notification sounds can be a lot of fun to play with and a great way to embrace Android customization. From having your device proudly announce “You’ve got mail!” through to video game noises, catch phrases from your favorite movie and snippets of your favorite song, if it can be stored as an audio file on your device, it can be your notification sound. But, how do you change it? In this tutorial for our beginning Android users, we’ll find out. Changing your notification sound can be done in a number of ways. Android has built-in tools to handle the setting, which we’ll be showing you today, or you can install one of many apps dedicated to the cause. The important thing here, which I am sure we’ve all learned at one point or another, be sure to choose an appropriate sound for your needs. It is funny when we see someone on TV make a fool of themselves in public or at work because of an inappropriate choice in ringer or notification sounds, but I doubt you want to be that person in real life. Changing notification sounds is quite simple and the process is nearly identical on all version of Android out there. Today’s imagery is from a vanilla Android 5.0.1 Lollipop device. Start by heading into your main system Settings. Find and tap on Sound and notification, your device may just say Sound. 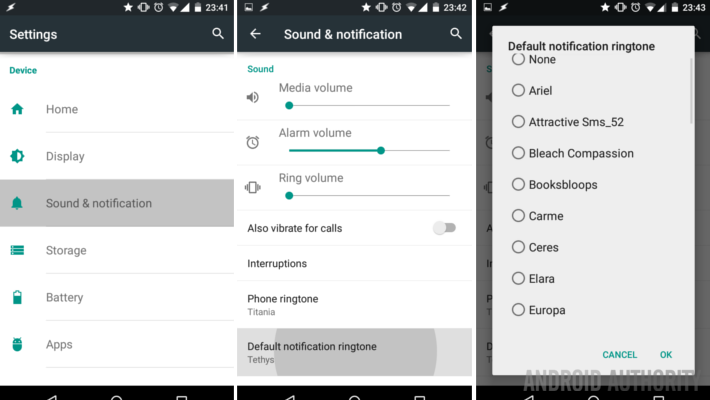 Find and tap on Default notification ringtone your device may say Notification Sound. If this option is grayed out on you, it may be blocked when your device is in vibrate/silent mode, or Priority mode, just turn your volume back up to continue. Choose a sound. This is the fun part, start tapping on each sound to hear it in action. When you’ve chosen a sound, tap on OK to finish. As you’ve seen, the above steps only let you choose a notification sound from the device’s built-in options. If you have your own audio file that you wish to use, you will need to employ a third party app to continue. This is where the sky is the limit. Using your own custom chosen media files as a notification sound is a marvelous customization for your Android device. We’ve already looked at this quite a while ago, I say a refresher is in order. There is a long list of apps that will help you here, a few of them you might not expect. If you are looking to take a clip of a music file, you’ll want to look at some of the many ringtone or .mp3 snippet apps like Ringtone Maker. If you don’t know what you want yet, you’ll want to use a discovery service, like Zedge. But if your file is all ready to go, look toward your file explorer for a potential solution. In these parts, ES File Explorer is a preferred file explorer by many. Among all the other things this app can tackle, operating as a media selector is one of them. If you have ES File Explorer installed, you will have seen the option to us the app when you tapped on Default notification ringtone above. ES File Explorer does not let you sample the files, it simply activates the file you tap on. However, once you choose the file, it registers as a notification sound and will be available to choose from the default Android sound chooser. Changing your notification sound can be fun, what is the craziest notification sound you’ve ever used on your Android device?